I really enjoy supporting local races – and since I started running more half marathons than 5Ks, I have been very limited on those distance races locally. A short drive away is Wamego, KS – home of the Wicked Marathon and Half Marathon! This is my first year running this course and minus some questionable weather, I really enjoyed the experience! Due to this race being a small local race, the mid-week packet pick-up was at a local fitness center. Little man and I stopped by after work on Thursday and were in and out in a jiffy! When we got home, I went through my packet! 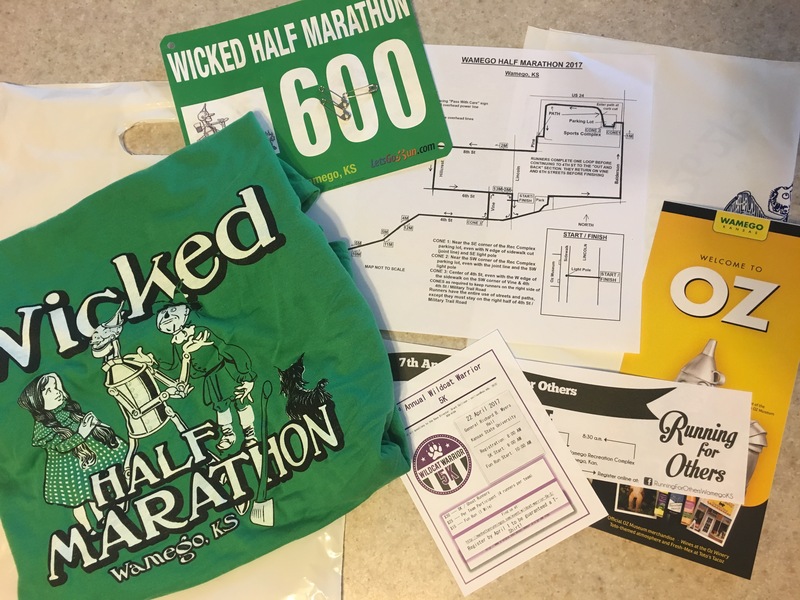 There was my race themed soft-style t-shirt, drop bag with all my info on it, bib with timing chip on the back, race course map, and a couple race/business related papers. I am really glad that there isn’t a phone book worth of paper in the packets these days…it always seems like such a waste. Since we already picked up my packet in Manhattan on Thursday, I didn’t need to grab anything more at the pre-race dinner. 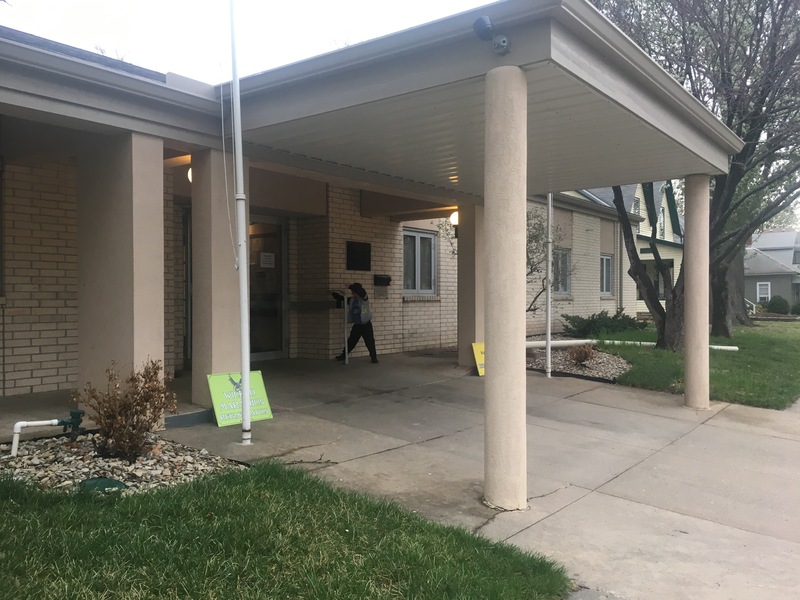 The dinner started around 5 or 5:30 pm at the Wamego Senior center. When we arrived, I met up with a couple local runners and their families. I brought some snacks for little man to snack on since the dinner was for runners only and I didn’t want to purchase a plate for him when he can sometimes be picky about what he eats… Once he was done snacking, he spent the rest of the time running around the area, playing with the “house” on the poster, and hiding under our table. The night before the race, I always am sure to get ALL my things around… This makes my morning craziness work quickly and without any many hitches or hiccups! 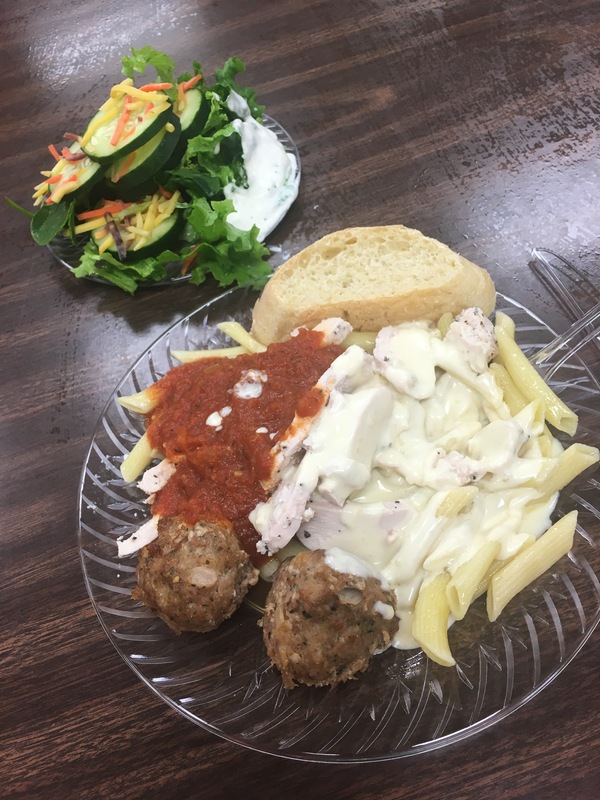 Granted, I don’t put my food in my pictures…but I keep my food and drinks on the table (typically a banana and coffee) to be sure those are easy to find, grab, and go! Once I was dressed, all glided up (it was going to be wet and rainy after all), I made up my coffee, grabbed a couple bananas, and hit the road! Since it was raining quite a bit, I decided to forgo my extra pre-race, training run miles and just jog a mile to the starting area. There is a bus that circled between the start area and this parking lot, but I decided to just run and get my legs loosened up a little. Once my mile beeped off, I was at the race day packet pick up tent! There were several people milling about staying out of the rain and cold. Since a couple of my running buddies were volunteering at the event, I hung out behind the table and helped exchange race shirts. Once race time approached, there were announcements for the runners to start lining up. I headed out and found my area in the starting gates. The rain was spitting at this time, but I was prepared with my hat and rain jacket. The elevation map for the race is a little crazy looking, but it wasn’t bad – rolling hills, a couple climbs (one in the last mile – ouch! ), and relatively flat feeling most of the race. This race is broken into 2 main parts : the “in-town” loop and the out-and-back. The race started in downtown Wamego in front of the OZ Museum. The “in-town” loop took us around the city for the first 4 miles (or the first 16 for the marathon – 4 “in-town” loops). We first ran through the main city park, down a residential street, down a commercial street, through the parking lot and sidewalks around the sports complex, back through several residential streets, through downtown, and off to the out and back section of the course. There were 2-3 water stops within this 4 mile section of the course – which seemed a bit much, even for the marathoners. At least everyone was hydrated! The out-and-back section was nice…but I could see how lonely it could get if you were alone on the road. The rolling miles out to the turnaround point were relatively dry…ish. The rain was off and on but around mile 7, the rain started to fall more steadily. The open road was a welcome sight and I enjoyed these miles. Around mile 6, some of the first finishers were on their way back into town. I kept anticipating the turnaround area around every corner and hill, but it didn’t happen…for a while! So I cheered on the runners that were coming back at me on the course. This section of the course was a little weird, because the runners were all on the left side of the road and also the runners heading back were on the inside of the left side… The road wasn’t completely blocked off from traffic…but it would have made more sense to have the “out” runners to the right side of the left lane and the “and back” runners towards the outside… Oh well, we all made it to the finish line. A little after mile 8 was the turnaround point. There were drinks and snacks, but I didn’t stick around long! I grabbed a couple Lara bar minis and headed back out! On the way back to the finish, the rain kept coming down! I cheered the runners heading to the turnaround point and the marathoners started passing me on their way out to their turnaround point for the out-and-back. They were running on the far side of the road with traffic, which is probably where we all should have been running on the way out… oh well! I was “fishing” on my way back to town – mentally hooking the runners ahead of me and reeling them in. My feet were sore from being wet, but I was able to keep my pace pretty easily through the rolling hills. I started recognizing landmarks along the way and knew that I was close to finishing! Once we got back into town for the last mile, I really gave it my all! I knew I was close to my “average” finishing time, so I wanted to make it happen! As you turn onto Vine Street, you are welcomed with your last uphill of the course…perfect timing, not! With my rain-soaked feet, I trudged up the last hill and then briskly, and carefully, ran down the last downhill to the finish. My feet felt like the skin was stuck to my shoes and I was convinced it would be a complete blister on the bottom – ouch!! This didn’t end up happening…but it sure did hurt while on course. I really enjoyed this race despite the rainy, cold weather. The course was great with rolling hills throughout, and the uphill finish was an interesting twist I didn’t see coming. The shirt, medal, and poster are great quality, but the post race direction was a little lacking. After the race, I found out that the marathon distance had to do the “in-town” loop 4 times before hitting the out-and-back section of the course, and that is not something I am interested in trying. I found apples, oranges, and bananas in tubs, and bagels and cookies as well. There was also stack of Gatorade and water. I hobbled back to the bag drop tent to get my bag and tried to stay warm – which I was not successful. Run and done! • I am happy with my effort and finish time! An easy marathon training run in the books – and now to the warm gym to finish up my miles for today! I didn’t care to take the bus to the start,…but by the finishing time, I was soaked to the bone and freezing. Seeing the waiting buses was a WELCOME sight and I was back to my car in no time. I like this event! I am not always a fan of the pre-race dinner, but I liked that I knew what I was going to have available to eat ahead of time, and it gave me a chance to come out to Wamego the day before, drive the course, meet some out-of-town runners, and see some local running friends. 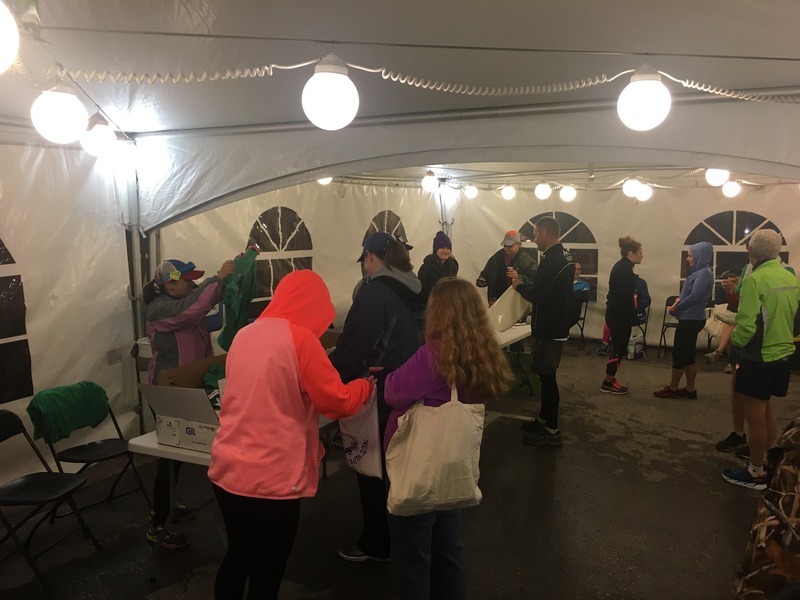 The starting area was organized with the race morning packet pick-up, porta potties, and starting chute in the same vicinity. The course itself was great – running past a few local sites (city park, ball fields, downtown, etc. ), wandering around more residential areas of town, the rolling hills of the out-and-back, and the downtown finish line. There were almost too many water stops in the “in-town” loop, but as long as runners were hydrated, that’s all that counts. While the post race experience left more to desire, the food and drinks available was nice. I didn’t use the shuttle service before the race, I was sure happy to see them waiting after the race! 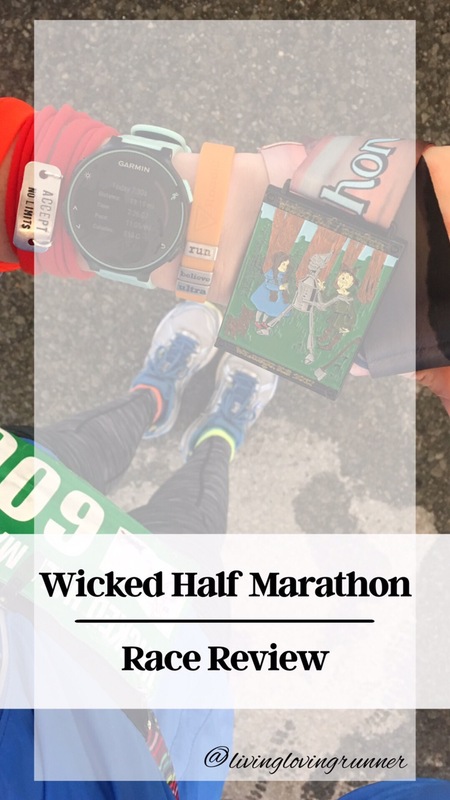 If you are looking to run a small town OZ themed race in Kansas, the Wicked Marathon or Half Marathon is your go-to race experience! This year, they added the 5K distance and a virtual race option – so keep an eye out for more race distance adds in the coming years! Check out some awesome fitness #linkups next week! Wednesday’s are full with Annmarie, Jen, & Nicole for Wild Workout Wednesday and Coaches Corner with Suz, Rachel, Debbie, & Lora! That is a great theme for a race in Kansas! It’s really too bad it rained. I saw some photos of people running in plastic rain coats. That has to be uncomfortable. Good job on your first half of 2017! Great recap! I love learning about the various races in North America, this one sounds like it has a nice local feel to it. Congrats on your half marathon and thanks for linking up! Congratulations!! I’ve run a 10 miler in the pouring rain and it was absolutely miserable at times – so kudos to you dealing with rainy weather for 13.1! I love the pictures along the road, it looks so peaceful! Despite a few hiccups, I’m glad you had a good time! It really wasn’t that bad while I was moving…after the race when I was standing around, THAT was when I got super cold.